Thangka Painting is a traditional art that evolved between the 7th and 12th centuries in Nepal and Tibet. 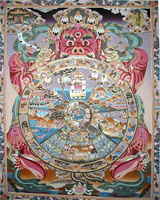 Painted on canvas and mounted in silk brocade, a thangka is more than just a work of art. 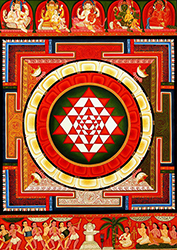 It is an object of devotion, an aid to spiritual practice, and a source of blessings. Thangka painting is strictly governed by iconographic rules. From the canvas preparation and drawing of the subject, through to mixing and applying colors, decorating with gold, and mounting the finished work in brocade, the creation of a thangka painting involves skill and care at each stage and illustrates particular details. 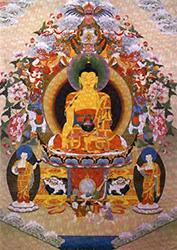 Thangkas are believed to create positive influences in their surroundings. Its brilliant colors and forms awaken the mind and energize consciousness; its images stimulate capacities for visualization and nourish the heart. It is said that just the act of looking at a thangka is itself a good deed. By meditating on such objects, one can train and gain an understanding of certain types of awareness that the specific image portrays. Another reason for commissioning a thangka painting may be to bring about good health, prosperity or long life.